What Is The Purpose Of A Yoga Rug? Yoga mat or yoga rug has now become an extension of the yogi. And that makes it an important part of the daily yoga practice. When a yogi lays down the yoga rug, he or she is committing to the practice and leaving behind a stressful daily life. It provides support and padding: Yoga on the bare ground can sometimes be painful. Imagine pressing your elbows, palms, or knees on the ground, for many it can be a painful experience. 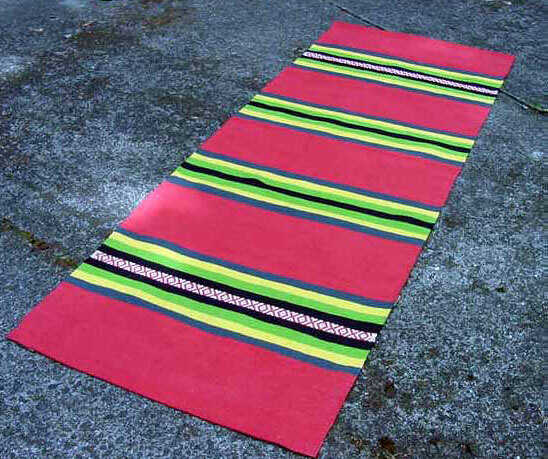 This is when yoga rugs help as they give you support and adequate padding to perform the asana smoothly. Yoga rug can turn a place into a sacred one: Yoga asks commitment and dedication, moreover for many yoga is a sacred practice and it deserve a space. When one is practicing on the mat it becomes a define space for the practice. Also, each time a yogi steps onto a yoga rug, he or she enters that sacred realm for yogis. Yoga rugs avoid the practitioner from slipping: A yoga rug with nonslip backing will help the rug not move while performing the poses. One can also place a yoga rug on a yoga sticky mat to avoid slipping. There are many who choose rug texture are over sticky mats. However, it is important to wash the rug on a regular basis as sweat gets deposited in the fibre and it becomes unhygienic to use the rug. At Garg Sports International, we have a wide range of beautiful yoga rugs designed to suit your style. You can use GSI yoga rugs when you start slipping on the regular yoga mats. These rugs are tastefully crafted to get you in the mood of yoga. Click here to check out our collection.